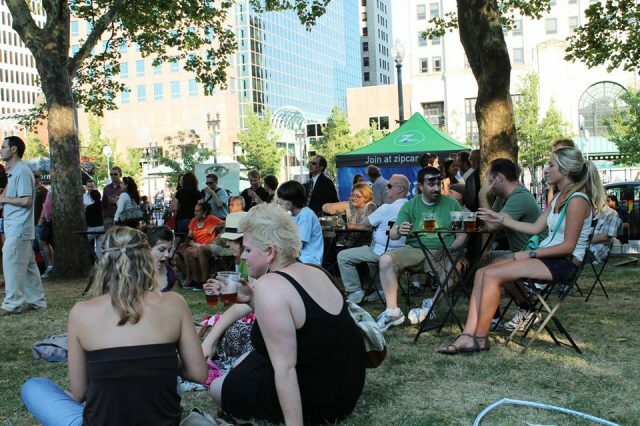 After being extended for two more weeks, tonight is for real the last Burnside Park Beer Garden Music Series event of the year. We’ve had a great season featuring a wide array of local music–clearly Providence has a wealth of talent! We have one more night for you on Thursday, Sept 19. Grupo Sazon, is an amazing Latin band featuring master percussionist Jesus Andujar. This high energy band, with Latin and Cuban influences, have lit up the WaterFire stage twice this season to rave reviews! What a great way to end the park series and usher in Fall. As always, relax before the show at the Trinity Brewhouse + Revival beer garden – serving locally brewed beer and wine starting at 4:30PM (music at 5:30PM)! Lawn games + food truck fare throughout – including Fancheezical, Lotus Pepper, Noble Knots, Panino Express + Like No Udder.